OM VISA Consultancy - Global Immigration, Students, Visitor, Business & Work VISA Consultants: Study at Czech Republic for 2017 Intake! !With less Tuition fee, easily get admission at Gujarat Leading visa consultancy Om international. Study at Czech Republic for 2017 Intake! 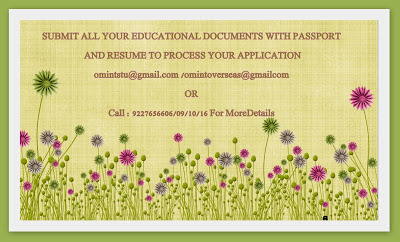 !With less Tuition fee, easily get admission at Gujarat Leading visa consultancy Om international. • In the heart of Europe and have a great chance to discover all European Countries. • Neighboring Countries-Austria, Poland, Germany. • High Quality of Education and research based universities. • Long tradition of quality education. • Diverse range of study programmes Offer for international students. • Cultural experience and fascinating history. • Lower costs of living as compare to other Western part of Europe. • 20hrs/week part time allowed during studies. • The Czech Republic is a landlocked country in the middle of Europe. • Over 37,000 foreign students are studying at Czech higher education institutions. • Czech universities offer long-standing reputations, unique conception specializations. • The costs of living in Czech Republic are not as high as the cost in Western Europe. • Borders with: Germany, Poland, Slovakia, Austria. • Czech higher education has a long tradition of over six hundred years. • Student should speak good English as University will conduct SKYPE interview before issuing offer letter.